How do know who qualifies for a viatical settlement? And what is a viatical settlement? How do you know how much value is in your policy? Above all else – how do you qualify? No two policies are the same when you consider the premiums that have been paid over the years, the age of the insured, and the health of the insured. Every policy, and every person looking to sell their policy, has to be looked at on a case-by-case basis. Calculating viatical settlements and selling your life insurance policy to a third party is not a ‘one size fits all’ endeavor. What Is The Cash Value Of Your Life Insurance Policy? For starters, how old is your policy? A life insurance policy has to be at least two years old to have any value. If a life insurance policy is less than two years old, and a claim is filed against it, the insurance company could challenge that claim. Is your insurance company solvent? Dealing with small insurance companies can be difficult at times, especially if they aren’t generating a cash-flow like the top insurance carriers. A company with an A or A+ rating is preferred, but it won’t be reason enough for you not to qualify. What is the value of your life insurance policy? It can be difficult to find a buyer for a life insurance policy that is less than $500,000. In fact, many buyers only purchase policies that are greater than $1,000,000.00 because of the expenses that are involved with buying a life insurance policy. But situations have presented themselves for buyers to purchase policies as low as $50,000. It just depends on the other qualifying criteria. How much are your annual premiums? Premiums can get very expensive once a person reaches their late seventies. In fact, some insurance companies have specifically increased the premiums on elderly Americans on certain policies that were issued in the 1980s and 1990s. “[The increase in premiums] has precipitated about a dozen lawsuits against insurers, some seeking class-action status. Many of the lawsuits claim that the insurers are raising their rates to force people to drop their policies entirely, often when they are too old to buy replacements. A canceled policy means an insurer gets to keep years of premiums without facing a future death-benefit payout,” Julie Creswell and Mary Williams Walsh wrote in an article published by the New York Times. If the premiums are too high, it could be too costly for a third party to buy out your policy. Insurance companies are raising these premiums because they have policies that were guaranteed a 4 percent return in a market that is only producing a 2 percent return. Do you have any cash value or a cash surrender value in your policy? The more cash you have in your existing policy the more difficult it is to exceed that value in the secondary market. Meaning, if you have a high cash value within your policy, you would most likely get more for your policy from your insurance company than you would by selling it to a third party. Term or Universal policies that have no value, or a diminishing value, are often the types of policies that have the most hidden value. What is your life expectancy? 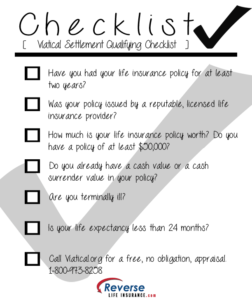 In order to qualify for a viatical settlement you must have a terminal illness. Under HIPAA, a terminally ill individual is defined to have a life expectancy of less than 24 months. A viatical settlement is an advance of your death benefit, and the IRS may treat it as such, meaning, a viatical settlement may not be considered taxable income. If you have a life expectancy of greater than 24 months, you can look into the option of receiving a life settlement. Generally, the shorter your life expectancy is the more value you may have in your life insurance policy. If you are terminally ill, you could look to your life insurance as a potential source of income in a time of need. At the very least, you should have your policy appraised to see if there is any value. Call us so we can help you find the hidden value in your life insurance policy.